During the month of April, I was busy giving Bible studies for the forth-coming mass baptism at Central Philippine Adventist College (CPAC). The first week of May was the celebration of the 50th anniversary of Adventism in Negros Occidental, Philippines. The church elders, brethren and Women’s Ministry members of Sagay where I am assigned, also gave Bible studies to many. During the anniversary celebration, the CPAC church and campus were overflowing with an estimated crowd of 10,000. During the week of the evangelism, approximately 7,000 people registered for the event, which filled the CPAC campus. The dormitories and classrooms were packed with guests, tents sprawled the campus grounds, and all roads seemed to only lead to the college. The nightly meetings were held in the college church. The highlight of the NOC 50th anniversary of Adventism celebration was the mass baptism on Sabbath, May 5. Approximately 1,300 people were baptized into the Seventh-day Adventist church. The adopted ministers of Negros Occidental Conference did groundwork for this event and brought in 497 of those who were baptized. I was able to recommend 15 souls for baptism. The baptisms that lasted for two hours took place in the CPAC swimming pool. 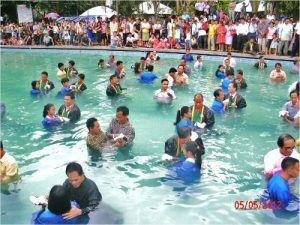 Pastor Alberto Gulfan Jr, president of the church in the southern Asia-pacific region (SSD), was among the pastors performing baptisms. Thank you to our sponsors for your support and love! Yes I find happiness in serving the Lord! Jesus is coming very soon but there are still many who need to know Him. How about sponsoring a theology graduate to do the work? We have over a hundred adopted ministers without sponsors. Please adopt a minister for $130 per month (married) and $120 per month (single). You will have someone who will be bringing souls to the feet of Jesus through your prayers and financial support. We will give you tax-deductible receipts for your donations. You may also send your donations to: AMI, 7811 Laurel Court, Denham Springs, LA 70726. Thanks so much and…God bless you! New Places the Best Places—The places in which the truth has never been proclaimed are the best places in which to work. The truth is to take possession of the will of those who have never before heard it. They will see the sinfulness of sin, and their repentance will be thorough and sincere. The Lord will work upon hearts that in the past have not often been appealed to, hearts that heretofore have not seen the enormity of sin.—Letter 106, 1903.